Giraffes, like all species, when young have a larger head to body ratio. Large heads are an indication of youth but as you can see the giraffe have even smaller head to body (microcephalus) which would indicate that they are not only mature, but they might be more mature, and therefore larger than todays giraffes. The modern giraffe is Illustrated, and is illustrated as an adult, and not an infant in this ancient relief. 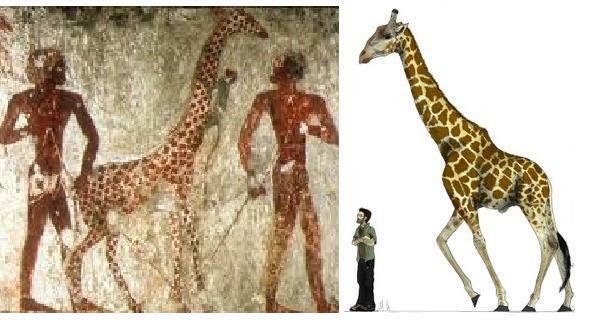 You can see in the modern human-male compared to a modern Giraffe on the right, and a giant humanoid compared to an even more mature giraffe which would be justified in being made larger than the modern giraffe. But for the sake of comparing the humanoids the giraffes are of a similar height. Many people may say “status” played a role in size, i will refute that as some slaves are depicted as large as the pharoahs, while others are depicted small. Conclusion: The artist intended to illustrate that some of the inhabitants of Egypt were indeed Giants, and depicted them with mature giraffes to illustrate what the artist (who is a visual person) saw giant humans before his own eyes. If this is a full-sized giraffe, then the monkey is a giant monkey. The type of monkey illustrated is a type that is small- never large. So I think you are really stretching. Also, artists don’t always depict things in scale. He may have wanted to show the giraffes and had to shrink them for space. There are many reasons why I would not base much on this mural. Mike, you did hit on an idea but didn’t bite. If all monkeys were larger in the past it would fit into the idea that all animals are larger in the past. . . and it would explain what evolutionists are truly finding in South Africa (The Greater Ancestors of Monkeys)There is a consistency that happens when you follow Greater Ancestry and not the academic-standard. Archaeology verifies anthropology as it does here when you use a greater model. Are we so sure this is a monkey? They color every other thing in the picture right. Look at the detail in the giraffe’s spots. But then use green to draw the monkey? I am not sure that is correct at all. People long ago drew themselves as big as buildings, little kids also do that today. That being said, these ancient drawings could show that people didn’t have a great perception of how large everything was compared to each other, like children today. Not that they were extremely tall. This theory can also prove why the head of the giraffe is so small in the drawing. The head of a giraffe looks smaller when it is up in the air, so without correct perception of shapes and distance, these people could have drawn the head of the giraffe much smaller than it really is. Our ancestors could very well have been, and most likely were, as scientist have found, just primitive people. So what you are basically saying is that you have bought into the mainstream model completely. . . . People in the past built the pyramids, we cant do that today, they moved stones like the Baalbek stone yet today i could go through any modern-wall with a sledgehammer, we use styro-foam and stucco while they locked their stones with iron clamps. I am more likely to believe “those-individuals” you mislabel as scientists are just primitive people. I don’t know if the monkey was depicted at scale nor do I see the size of the monkey as a critical to your argument. The depiction of the giraffe is, however, an entirely different matter and it seems was intended to show its comparative size alongside the giant beings. Thanks for sharing. Thanks for thè additional information. You’ve created a wonderful and informative site.